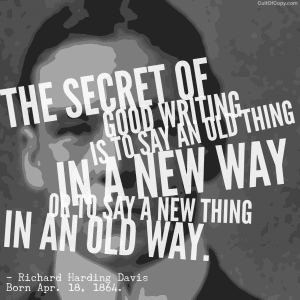 “The secret of good writing is to say an old thing in a new way or to say a new thing in an old way.” – Richard Harding Davis, Born Apr. 18, 1864. I wouldn't say it's THE secret… But it IS a great trick. Can't think of something to write? 1. 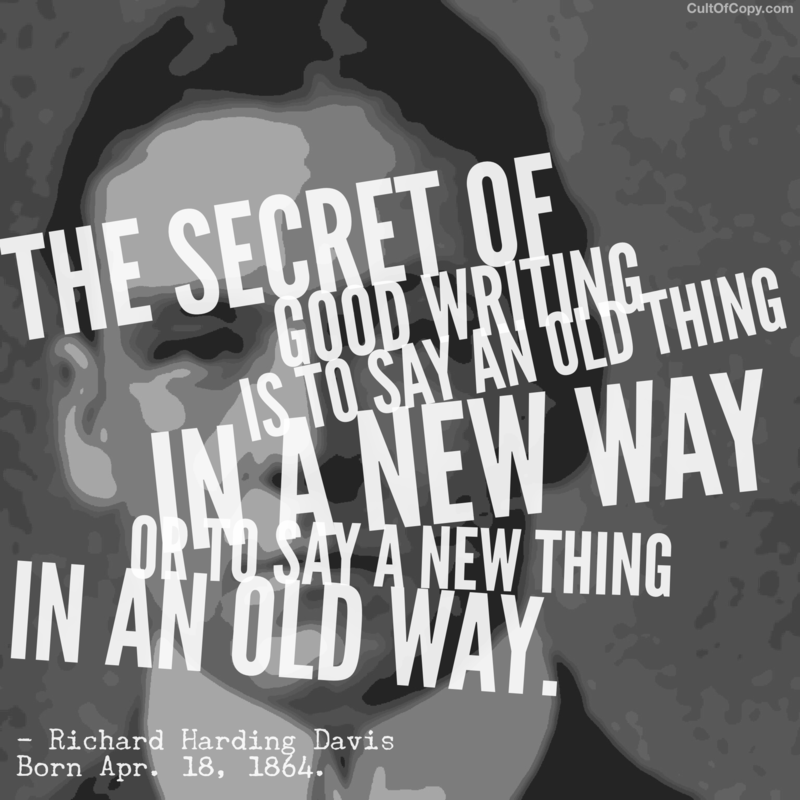 Take some old adage (or quotation) and come up with some current way to apply it to whatever your topic is. Kind of like what I do with these daily quote essays. Or in any of the training and mentoring I do. I have not invented any new ways of understanding human nature. I HAVE thought of a couple of neat ways to DESCRIBE those. I have come up with a few effective formulas for applying those, too. But I am not an inventor or innovator. I apply stuff “old” stuff I learned elsewhere, and report back to my audience, and teach what worked for me – thereby creating “new” and unique information. 2. Take some new buzz topic everyone is yammering about and explain it via analogy by comparing/contrasting it with something old and more commonly understood. Websites are like real estate. Facebook ads are like local classifieds. Now, you shouldn't rely on one or the other of these two exclusively. Alternate. Oscillate. Use both interchangeably and in combination, even. Because this creates an image of you in your audience's mind – you are a nexus of understanding, pulling treasure from the forgotten past – and making the constantly arriving future more manageable and comprehensible. Your the savior of the masses in your niche – people who are just behind the bleeding edge, seeking guidance, and who come to your arena from elsewhere with catching up to do. You create a shortcut for their process when you write this way.